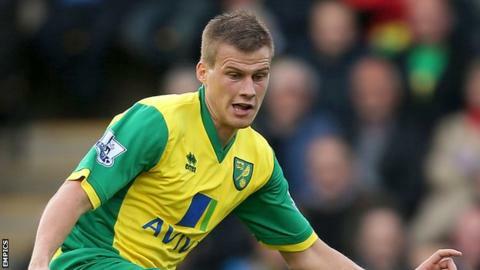 Norwich City defender Ryan Bennett could be out for up to eight weeks after undergoing ankle surgery. The 24-year-old was taken off on a stretcher during Saturday's derby victory over Ipswich Town. "It could be six to eight weeks. They're pleased with how the surgery went and it's not horrendous," City boss Neil Adams told BBC Radio Norfolk. "You keep your fingers crossed for a good scan, but it revealed he ruptured one of his ligaments." Bennett, who has played 50 times for the Canaries, was making his first start of the season at Portman Road, but was carried off after just seven minutes. He said on Twitter after Tuesday's operation: "Bad news but that's life and football. Good news operation went well today."